Are you ready to explore Washington, DC in a luxury vehicle with a view like none other? 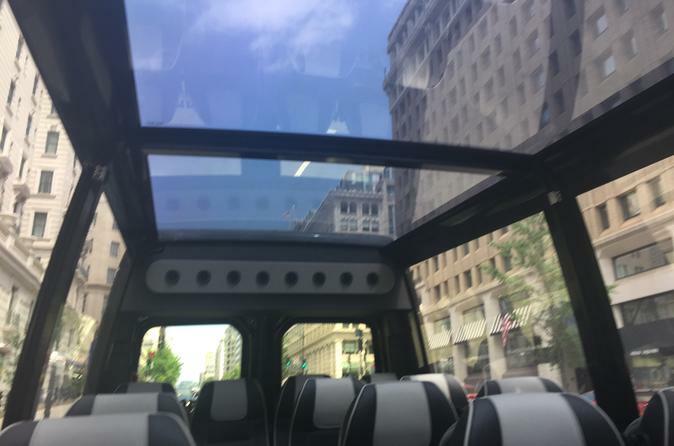 The glass-top convertible SkyVue is here to revolutionize chauffeured tours of our city. When weather permits, you'll enjoy the open air. When the sun or rain require, the glass top protects you from the elements without obstructing your views of our incredible city. With a knowledgeable and qualified tour guide on board, this fully narrated tour highlights the history of Washington DC and the surrounding areas. Your tour starts with hotel pickup in your private vehicle — a luxury van with a glass top that comes down when the weather permits. In other conditions, the clear glass protects you from the elements without obstructing your views of Washington D.C. Your private guide takes you around this great city, sharing stories and knowledge of the history of the American capital. Tours are available in the morning, afternoon, and evening as the city transforms under different light. With a professional driver at the wheel, you won't have to worry about the hassle of navigating the city; instead, you'll be taken anywhere in the DC or Northern Virginia area with easy access to monuments, airports, museums, and more. Sights you may choose to see include the U.S. Capitol, the White House, World War II Memorial, Thomas Jefferson Memorial, Martin Luther King, Jr. Memorial, Lincoln Memorial, Franklin Delano Roosevelt Memorial, Iwo Jima Memorial (a.k.a. Marine Corp War Memorial), Air Force Memorial, and historical Georgetown. When your tour ends, you'll be returned to your D.C. accommodation.